Just got back from a hectic week or so in the UK on business. 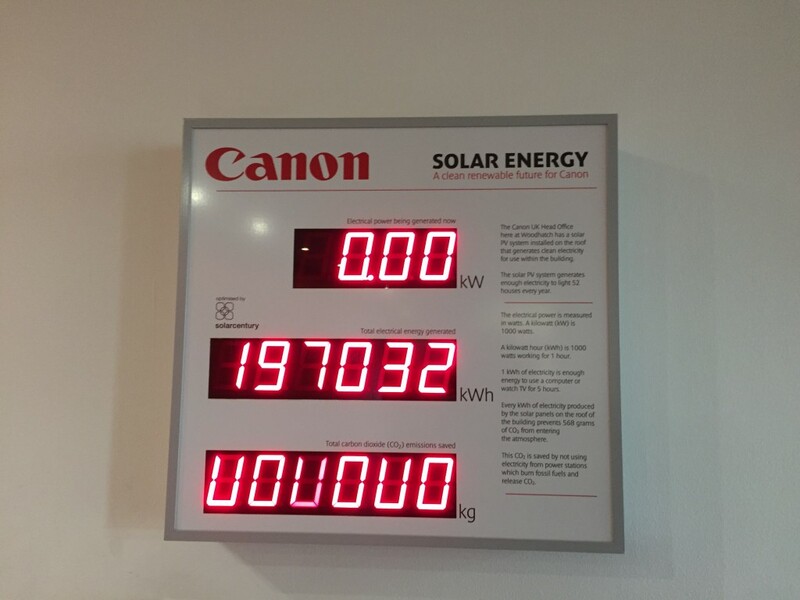 Most of my time was spent a stone’s throw from Heathrow at the Stockley Park HQ of Canon Europe. As I wandered between the two Canon offices in the business park, I realised that I’d actually visited the Apple offices there years before in a previous life. At the time they were pushing their server business to us as a reseller. Seems like another world… definitely pre-iPod! It was also great to see so much variety of cars on the road too. Things are so limited here in Canada with the huge pressure from the US manufacturers. 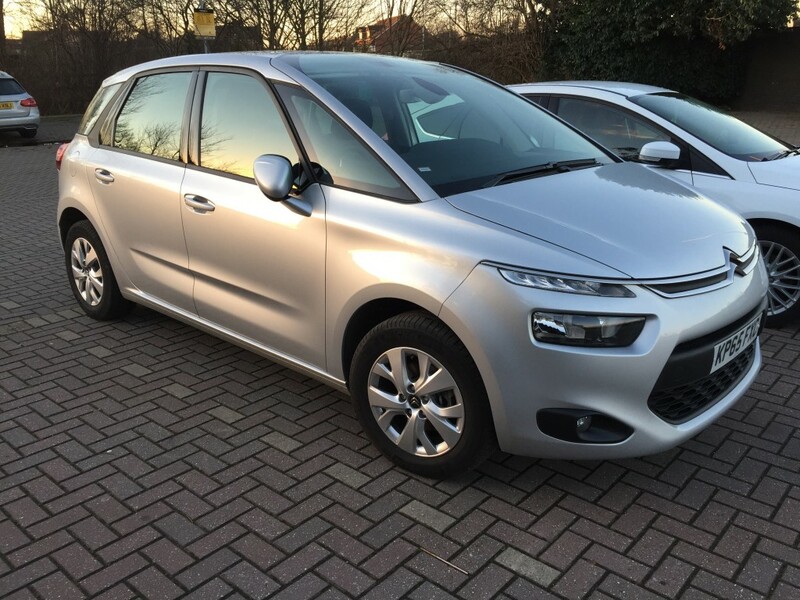 I had a Citroën Picasso C4. Everything was electronic – not just the hand-brake. I think the speedo was broken though. Surely diesel cars don’t do 90 mph do they? (145 km/hr in new money). The wipers came on when they felt the windscreen was a little moist. The headlights came on when they thought it was dark enough. Pretty much everything except the expected GPS. “SatNav” as it’s known over there is a chargeable option on hire cars. I wasn’t going to pay for what my phone offered for free. Yup: solar energy only works in places where the sun shines… they could have saved power by just painting zeros on a piece of cardboard. After performing my duties in the office I took the opportunity to visit my parents in Yorkshire for a day, so I headed north and somehow beat most of the Friday night exodus from London on the M1. 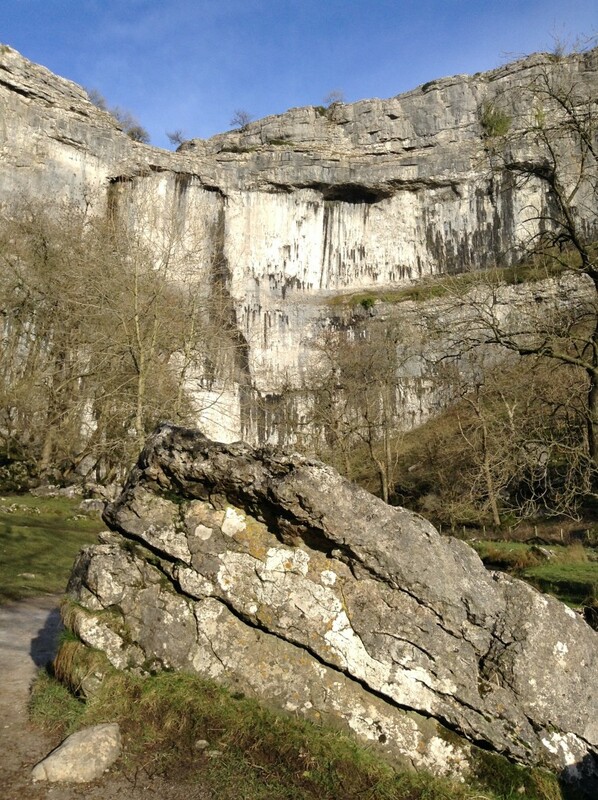 After a peaceful night’s sleep we drove to Malham on Saturday morning, visiting the cove there. I hadn’t been since I was a kid. 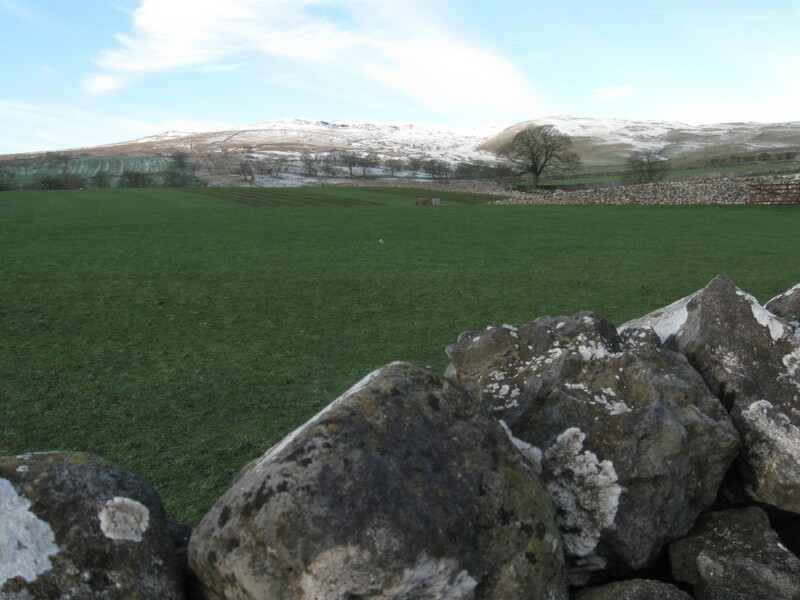 It was incredible how peaceful the Dales are. As a National Park, the building and therefore traffic is restricted and it shows. It was just like I remembered it 40 years ago. Every other vehicle you see is STILL a Land Rover Defender! And not for show, either. These 4x4s earn their keep on the many farms. As we entered the village, visitors cars were already parking along the side of the road (see above! ), which indicated the National Park car-park closer to the village centre was likely already full. The view over the drystone wall to the hills in the west were stunning. 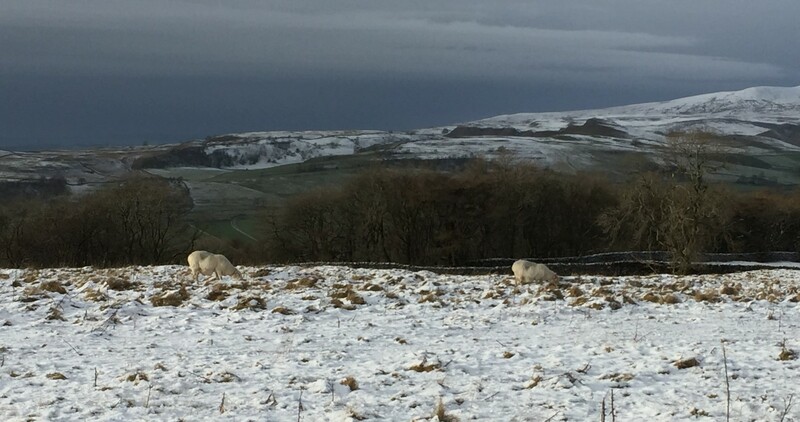 This was a very typical view – sheep behind ancient drystone walls, gently rolling hills occasionally broken by limestone scars… and a sprinkling of snow on “the tops.” The tops in this case being Kirkby Fell. 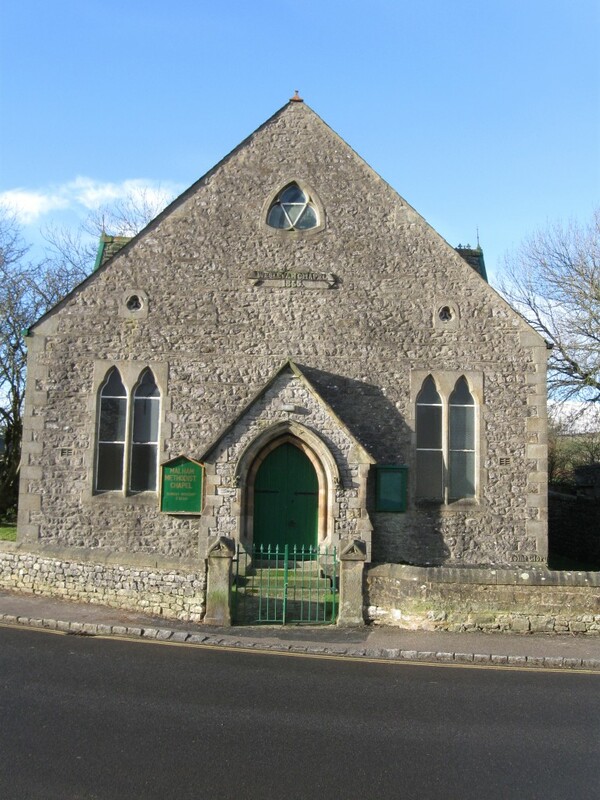 One of the first things you pass as you enter the village from the South is the Wesleyan Methodist chapel, built in 1866. Just for context, that’s when the Colony of British Columbia and the Colony of Vancouver Island were united as British Columbia, with the capital at Victoria. 20 years before the town of Granville was incorporated as “The City of Vancouver”. As we walked through the village we came to the little traffic island with a road sign dating from years past. This “fingerpost” style was made redundant in the ’60s as part of the Worboys committee review. Note at the the top it says “Yorks W.R.” for Yorkshire – West Riding. The Riding has long since been dissolved in favour of simply West Yorkshire. As I left the country 15 years ago, the debate lingered on about whether the political entity of “Humberside” was still philosophically part of Yorkshire… wars have been fought over less. Note also the 6 digit number at the lower part of the ring (you might need to click on the photo to expand it in order to see clearly)… this is an Ordnance Survey grid reference added as an experiment in West Yorkshire road signs to help the lost traveller to figure out where he was. The Ordnance Survey was a mapping project originally undertaken to help with the placing of guns (yup – a survey for ordnance) in Scotland in the wake of the Jacobite rebellion in 1745. It is now a comprehensive mapping scheme for the entire UK. 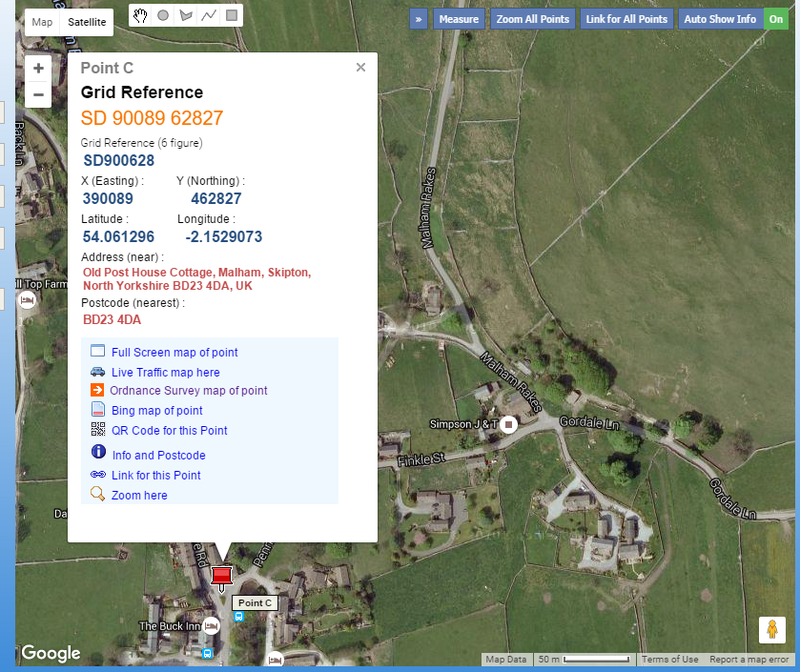 Sometimes prefixed by a letter code (SD in this case) so you know which map or “sheet” to look for the grid reference on, it identifies your location to within a few metres. 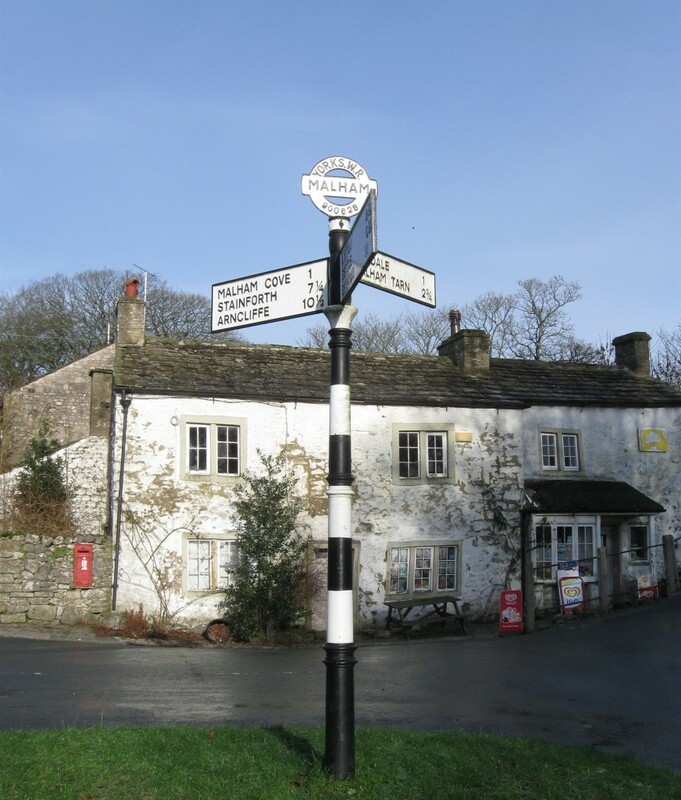 Malham’s sign gives a reference of 900628 which gridreferencefinder.com confirms is where it claims to be. The extra accuracy of modern satellite mapping allows a 10 figure version of a grid reference to be given if you’re REALLY specific. 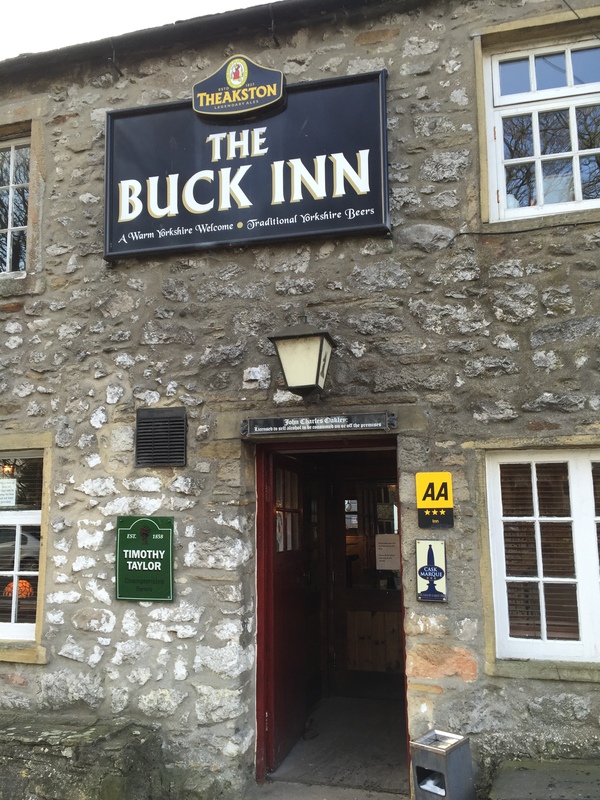 Of course “just up the road from the Buck Inn in Malham” worked pretty well too! 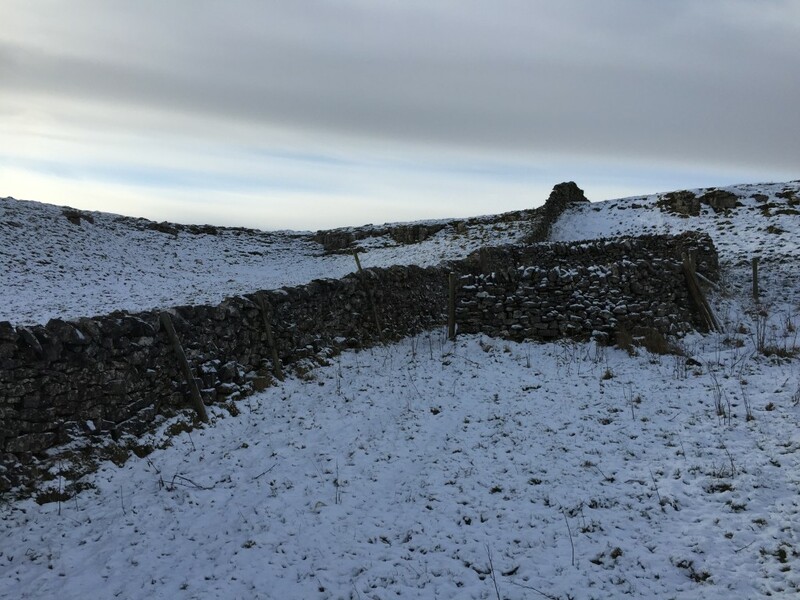 As we headed NW on the Cove Road out of the village towards the Pennine Way footpath, we were rewarded with more stunning views (to the East this time) of the typical sheep enclosures in much of the Dales – the mosaic of drystone walls. The cove was already visible as part of a broader limestone feature. It’s to the right in the photo below. From this distance though it was just a temptation. The winter sun was bright and the air crisp. A challenge to avoid shadows in the photos! 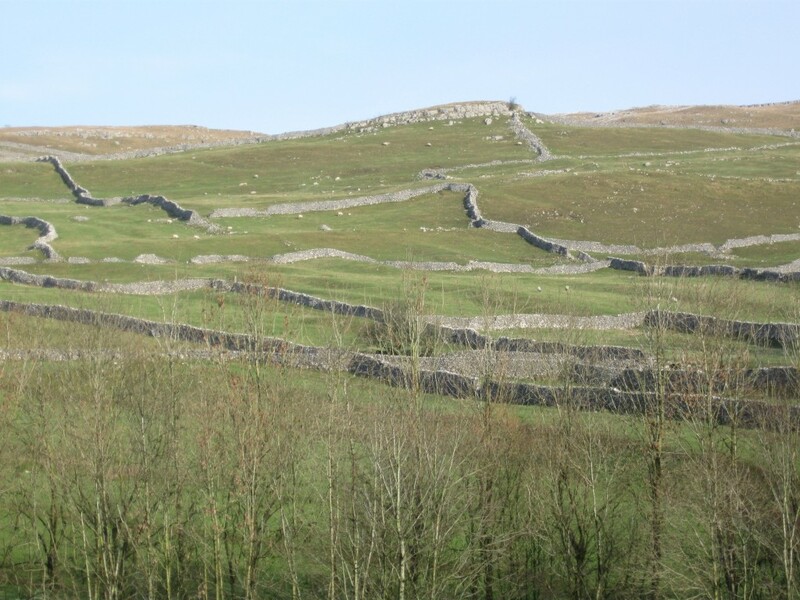 Malham Cove from the start of the path. Time for some artsy photography now. To the left of the path was a road. Beyond that was a field with a small barn called – logically enough – High Barn. SD896633 just for “reference” :). Separating all these features were drystone walls. The layered effect struck me as worthy of capture. You can see we’re steadily gaining height and we’re right at the snowline, such as it is, after the light sprinkling. 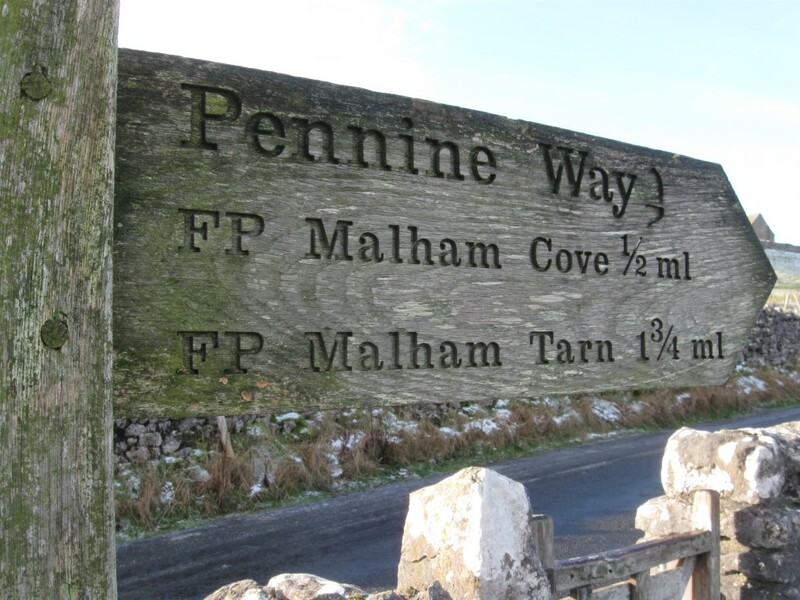 The path we were on from the village to the cove was actually part of the Pennine Way. 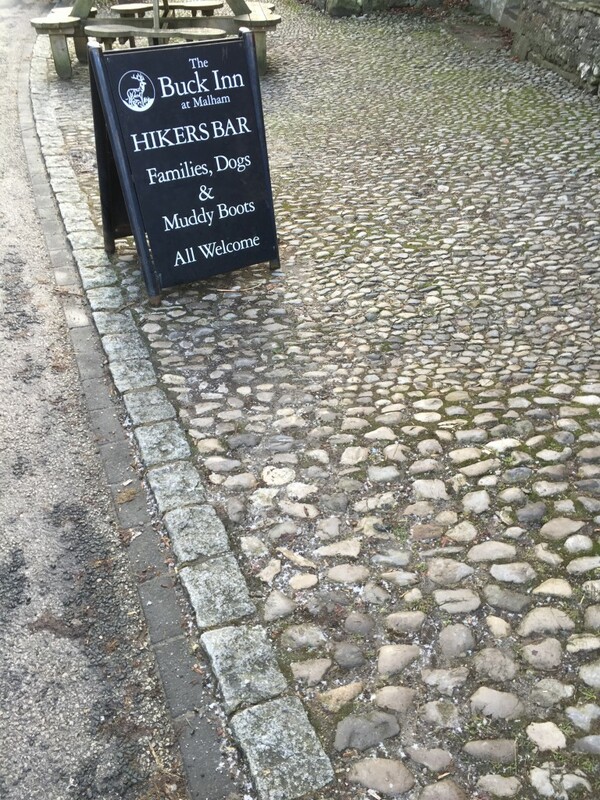 We were only walking a half mile or so of it, but it stretches 267 miles up the backbone of Britain. It used to be on my “to do” list, but I guess that’s no longer realistic. As we got closer, the cove became more dominant and the black streaks it’s famous for become more noticeable. 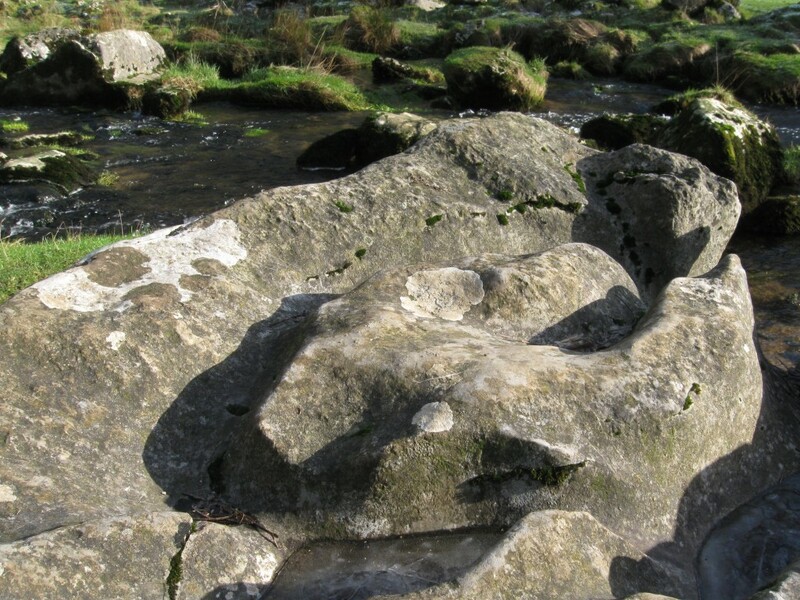 In Charles Kingsley’s Victorian book The Water-Babies these are attributed to the main character Tom (a boy chimney sweep) clambering down and leaving soot marks. 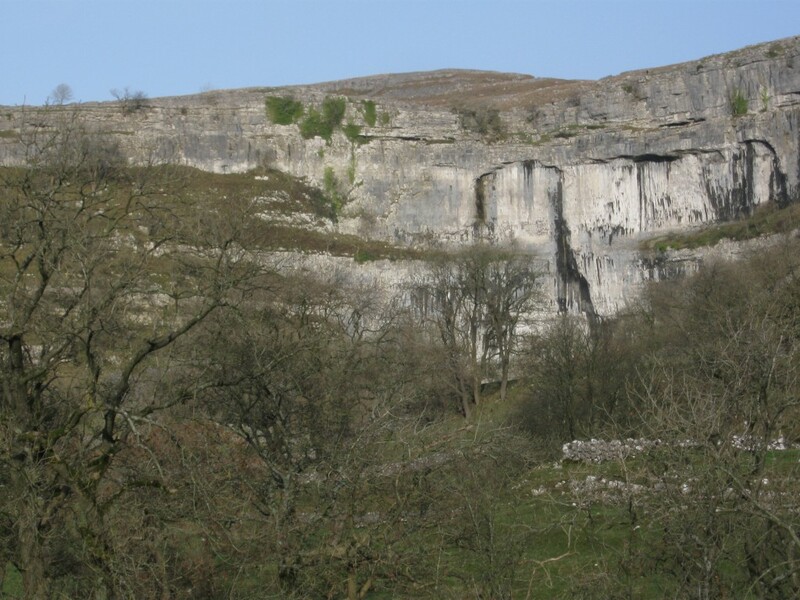 Limestone is very hard-wearing, but glaciers make short work of it over the millennia. 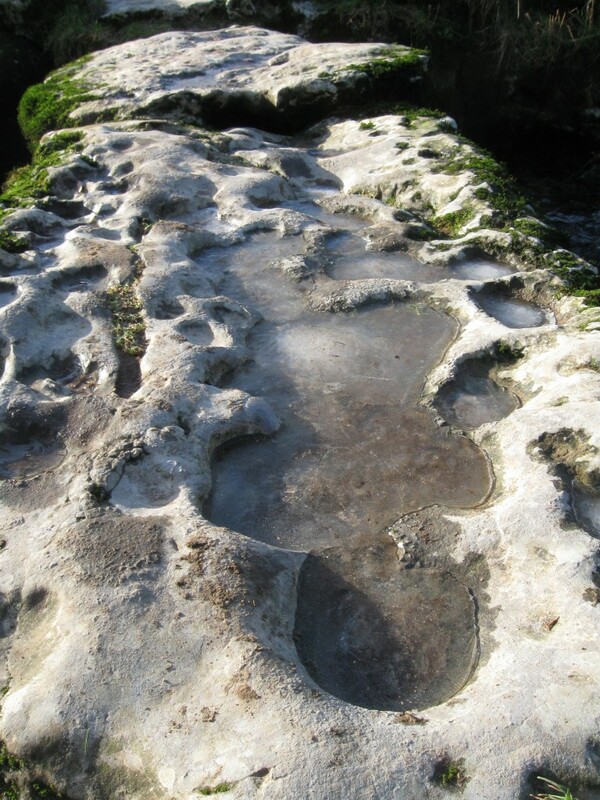 Slabs of it had been used to bridge the small beck flowing from the foot of the cove, and pools of water had frozen in the hollows making a most interesting effect. The power of the glaciers to move huge chunks of rock around and wear away at the rock face defies imagination. I am always calmed in the face of such natural, slow-moving power. One scoop of lime or two? Finally we were there and the sheer scale was apparent. 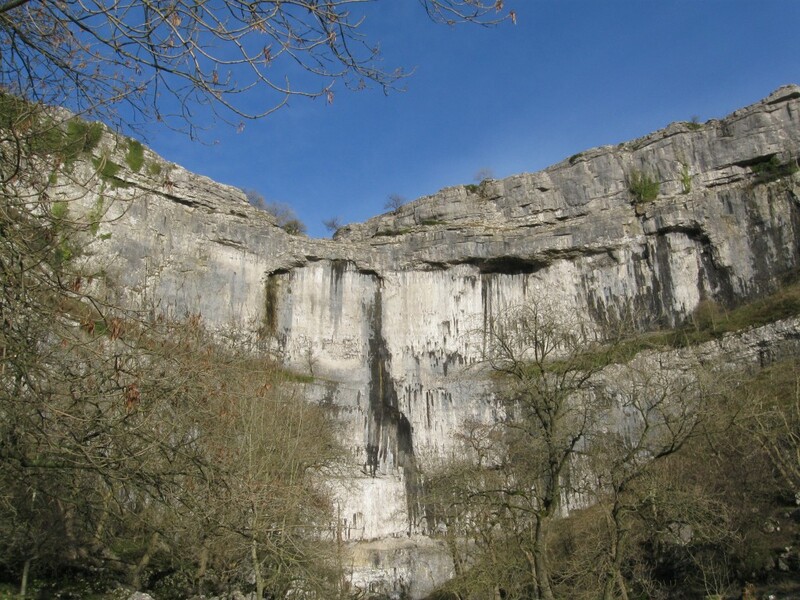 It seems that during the harsh rains at Christmas which caused much flooding in the area, this long defunct waterfall once more gushed and was briefly the UK’s highest “single fall” waterfall once more. The sheer power could only be imagined on this lovely sunny day though. The pleasant stroll back offered even more views of this lovely, relaxing place. I could feel the vitality of it soaking into my bones. So calming. Time stops in such places. 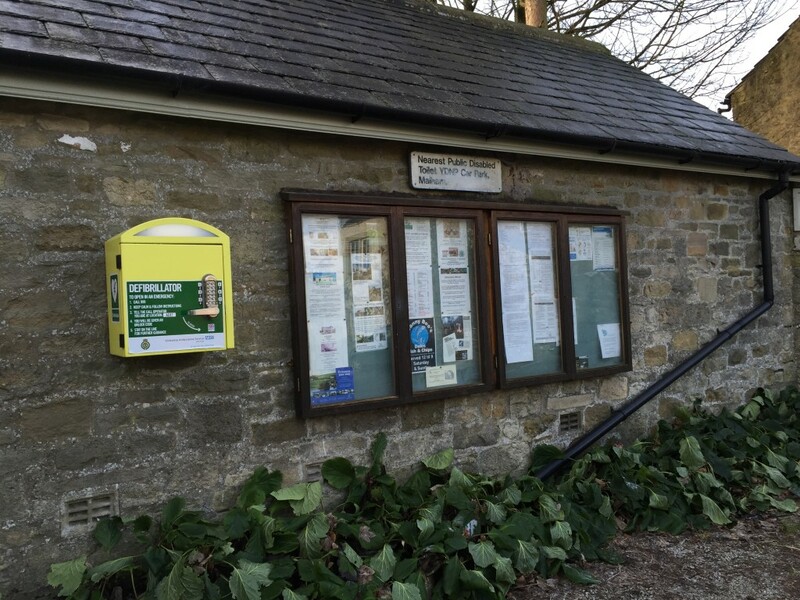 AED on the wall… just in case! Just for context, here’s a snap from Google Maps to show the village (and thankfully it IS still a village – there is little development allowed) to the South, the cove to the North. 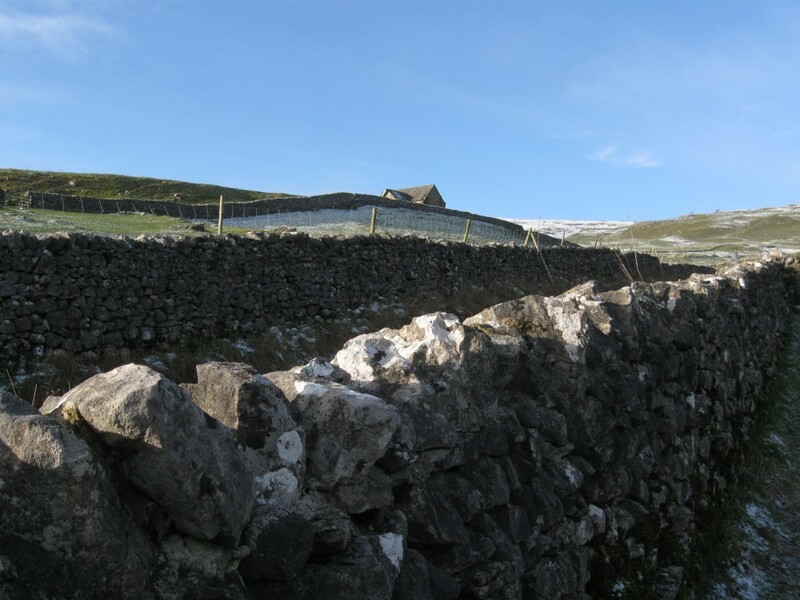 See the pattern of drystone walls – they’re pretty much everywhere in the lower Dales. The limestone terraces are quite clear even on this satellite image. 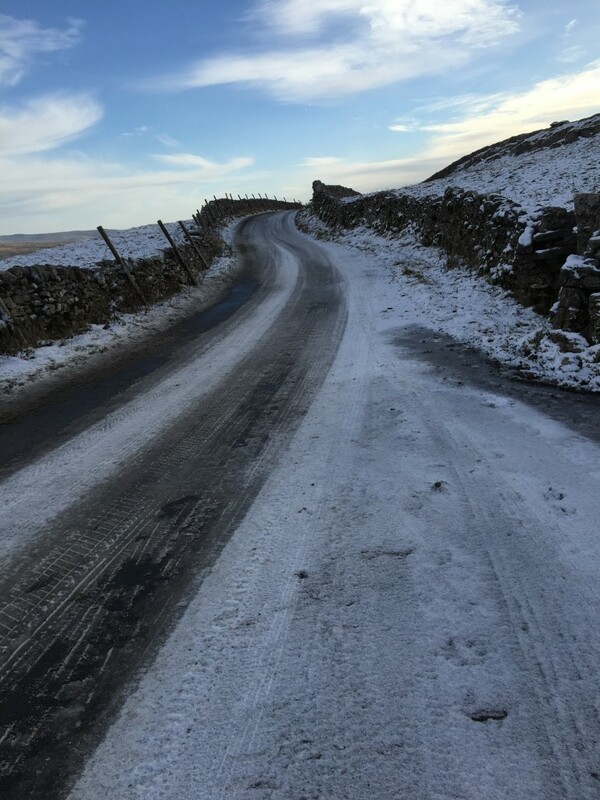 It was now time for lunch, so we headed up the road to the NW to drop down via Langcliffe into Settle. 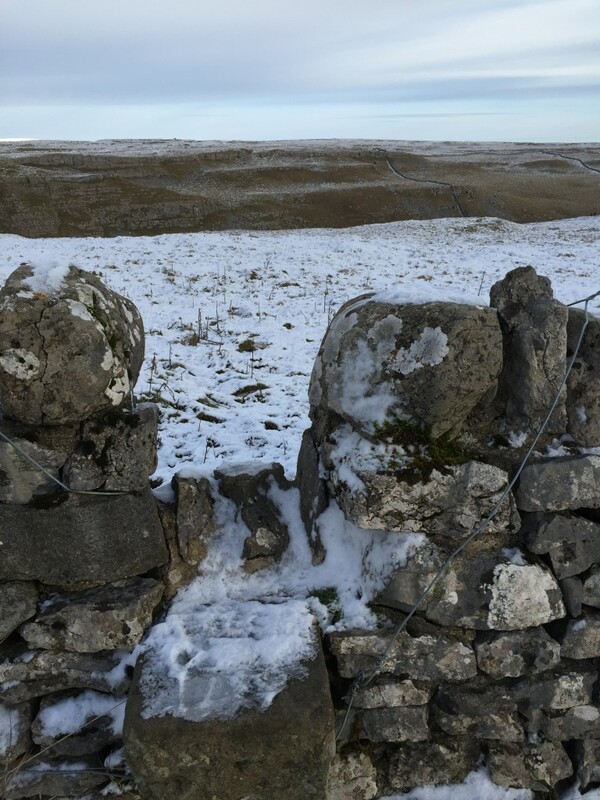 Even this gentle increase in elevation was enough to take us above the snowline, and we briefly stopped to take a few photos of the stark beauty that is The Yorkshire Dales. 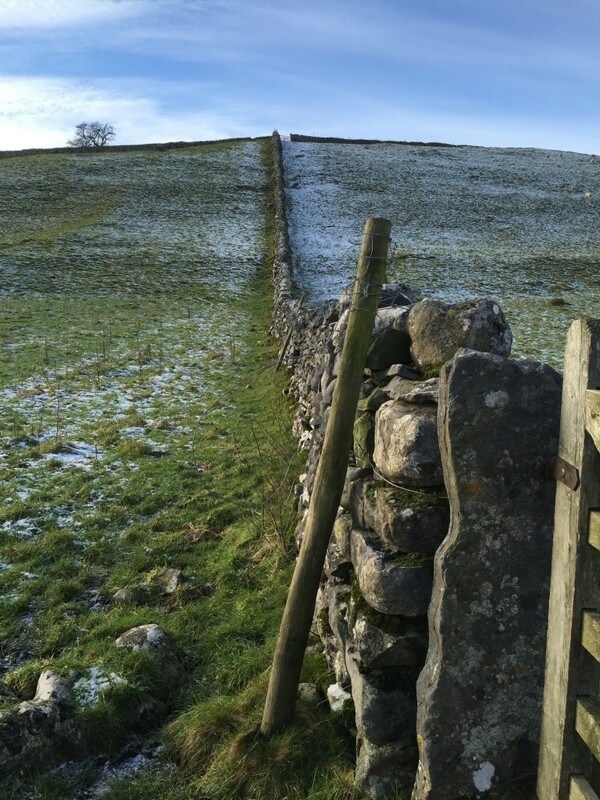 Stile over the wall to keep the sheep in. Hikers can’t forget to close it like they can with a gate! One more stop on the road to Langcliffe and Settle. 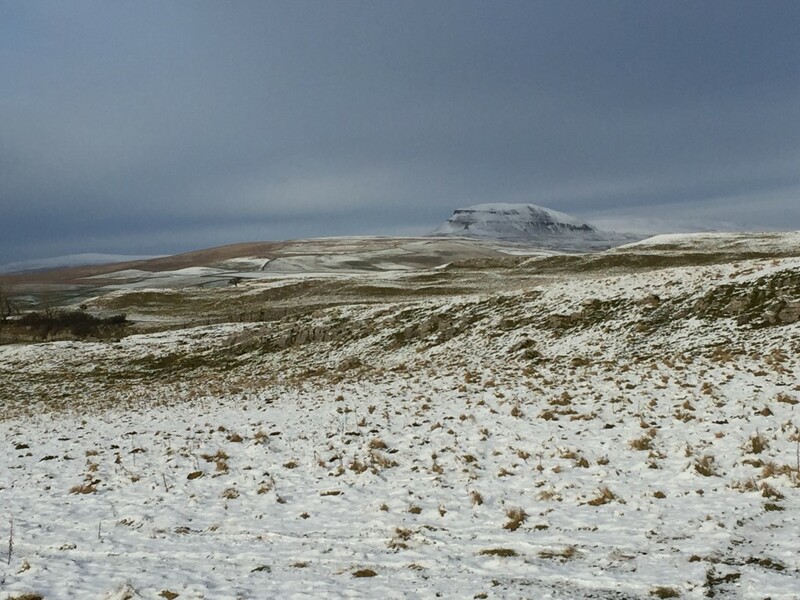 Here we were looking to the North-West and could clearly see the magnificent Pen-y-Ghent to the North. It was a great way to end the trip out and I felt totally revitalised after only a few short hours in this amazing place. You’ll likely need to click on the first pano. shot to make it clear enough to see Pen-y-ghent on the far right. It was about 5 miles away. 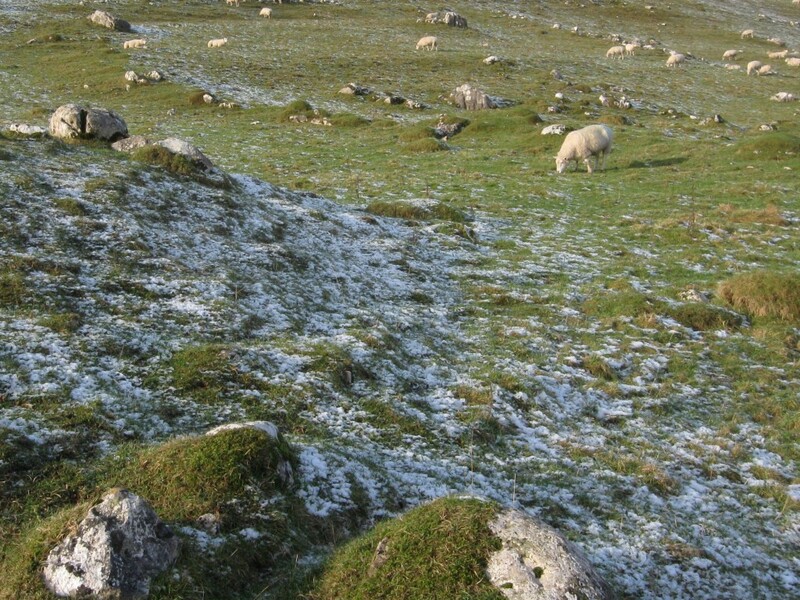 Just chillin… as sheep on the moors are wont to do. Pen-y-ghent looking as magnificent as ever it did. 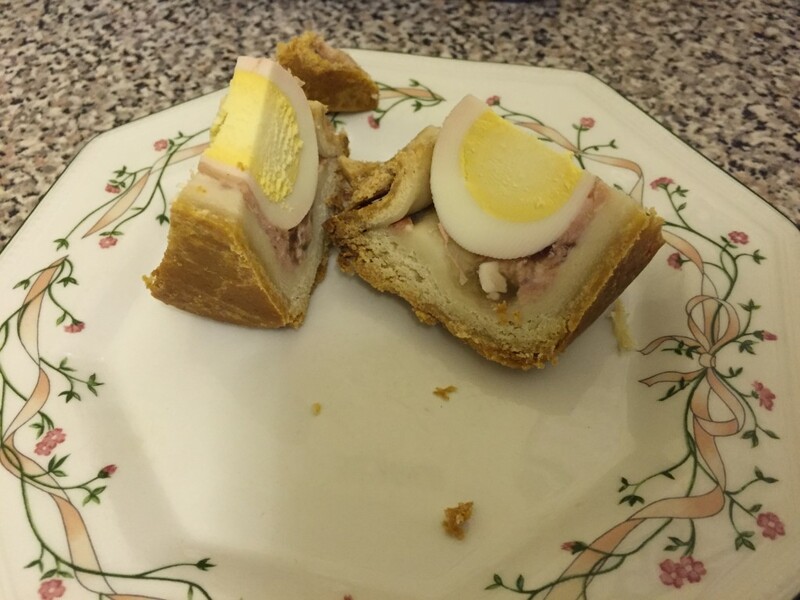 Once we were home, I treated the folks to pork pie with egg. For no other reason than I’ve never seen it here in BC and it reminded me of my childhood. If you fancy it yourself, try the BBC recipe here.